Ana María Archila emigrated to the U.S. from Colombia at the age of 7 and has become a leading voice for racial justice, economic justice and immigrant rights in New York and nationally, first as co-Executive Director of Make the Road New York (MRNY), and now as co-Executive Director of the Center for Popular Democracy (CPD). During Ana María's 13 years at MRNY and its predecessor organization, the Latin American Integration Center, Ana Maria helped build a build the organization into a powerful force for change in New York and nationally. The 16,000+ members of Make the Road New York, mostly working class Latino immigrants, have led some of the most transformative victories for low-income New Yorkers over the last decade: With their determination and strong advocacy, members of MRNY have helped put millions of dollars in the pockets of low-wage workers by winning increases to the minimum wage, paid sick days, and strong protections from wage-theft; and they have led the ambitious campaigns to win public policies that make New York City one of the leading Sanctuary Cities in the country. By organizing in neighborhoods across New York City and Long Island, MRNY members are bringing the experiences of immigrants to the forefront of the public debate and are shaping public policy on housing, education, health care, policing, civil rights and more. In 2014, Ana María stepped into a new role as Co-Executive Director at the Center for Popular Democracy, and helped build it into one of the largest community organizing networks in the country, with 53 affiliate organizations in 34 states, plus Washington, D.C. and Puerto Rico. CPD and its affiliates represent a powerful multi-racial alliance of immigrants, African Americans and white working class communities working to advance an agenda of racial and economic justice, and a vibrant democracy. CPD and its affiliates have played a major role in the national movement to raise the minimum wage and win family-sustaining jobs, resulting in raises for close to 11 million workers. Working with local progressive elected officials, the CPD network has helped elevate the role of cities as places for policy innovation that advances immigrant rights, workplace justice, and economic opportunity for communities of color. In this moment of increased threats from the federal government, the organizations that are part of the CPD network are helping drive participation of people across the country to protect our communities, and advance a vision for justice and opportunity for all. Maria was born and raised in Westchester, NY and is a graduate of Northeastern University, where she studied in Psychology with a concentration in Applied Behavioral Analysis Therapy. Upon graduation, she moved to Washington D.C. to work in finance with an emphasis on socially responsible investing. She volunteered all throughout high school and college in both special education and female empowerment. She became involved in activism while attending university and began attending marches and rallies in the hopes of making her voice heard. Like many survivors of sexual assault, Maria followed the story around Supreme Court nominee Brett Kavanaugh incredibly closely. 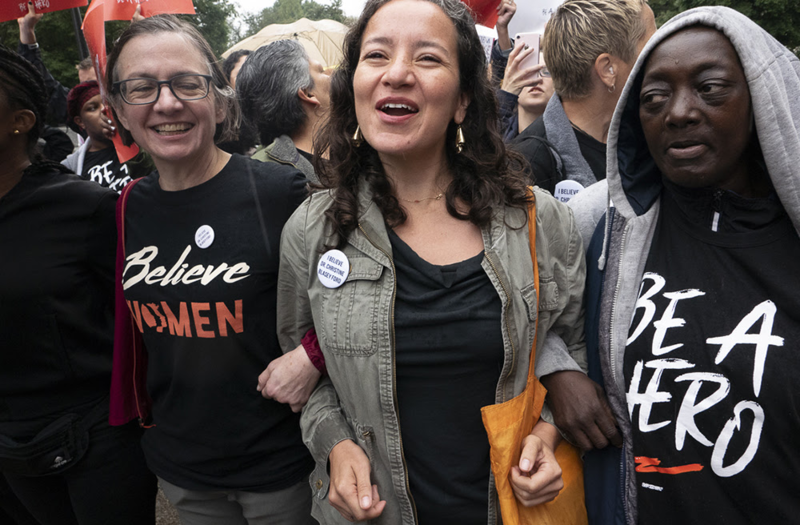 The day after Dr. Blasey Ford’s testimony, Maria took the morning off of work feeling strongly that she wanted to add to the voices of thousands of people speaking out against the pervasive problem of sexual violence in society. She garnered national attention with Ana Maria Archila for confronting Senator Jeff Flake in an elevator as he went to vote on the confirmation of Judge Kavanaugh. Maria continues to work in finance and tries to do one thing a day to make the world better.